The Stan Van Gundy era came to an end in Orlando on Monday when the Orlando Magic fired their coach. The firing has to be both a blessing and a curse for Van Gundy. He doesn’t have a job but at the same time he no longer has to deal with Dwight Howard drama. Van Gundy and the Magic’s star center Dwight Howard have been feuding all year both behind the scenes and in front of the media. Their were rumors that Howard was calling for Van Gundy’s firing by the middle of this past season. Even though Magic front office staff had confirmed those rumors, Howard has repeatedly denied such allegations. Well Monday it came to pass and Van Gundy was gone, whether it was due to the pressure Howard put on the Magic is hard to say. Stan Van Gundy came to the Magic in 2007. He was essentially a back up plan when the Florida Gators head coach signed with the Orlando Magic and then 5 days later quit and went back to the Gators. 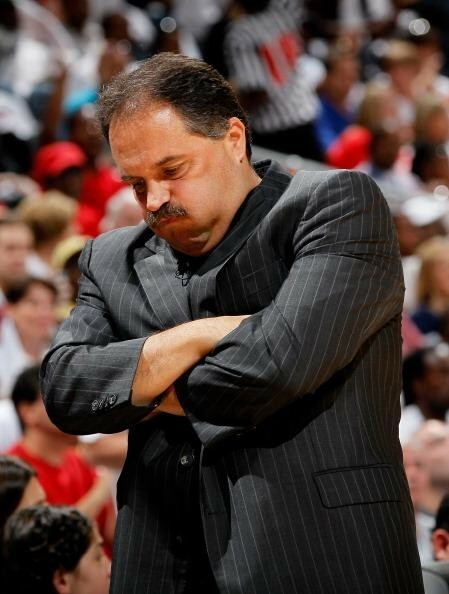 There have been a lot of ups and downs for the team during Van Gundy’s tenure. Van Gundy leaves the Magic with a 259-135 record and a 31-28 record in the playoffs. He was with the team for a total of 5 seasons. The Magic made it all the way to the NBA Finals in 2009, only to fall victim quickly to the Los Angeles Lakers. The Magic also made an Eastern Conference Finals appearance in 2010 losing the series 4-2 to the Boston Celtics. The timing is very strange to me though, with the NBA Draft is coming up next month. The Magic need to find their new head coach and they need to find him soon. It is imperative to have a new coach in time to have him on board for the draft and helping the team set for in a new and hopefully successful direction. This next season will be a very interesting and probably very stressful on for the Orland Magic. Dwight Howard’s contract is up at the end of the season. The Magic will definitely want to either sign Howard or trade him away. The Magic almost traded Howard this past season when it was unclear whether he would accept his team option for another season to close out his contract. The Magic have never forgotten the situation Shaq put them in after the 1996 season. Shaq left the team for The Lakers and the Magic got nothing in return due to the fact Shaq was a free agent. Howard is a fantastic player and has potential to be an NBA Finals MVP. Howard will however need to tone down the drama that plagued last season in order for that to be possible. He would need to make a decision and resign or have the team deal him away way before the trade deadline if he wants to contend for the NBA Championship this season. One has to hope that with Van Gundy gone Howard can focus more on the court and lead the Magic the way he has shown himself capable of doing. So will we see Dwight Howards final game with the Magic this year or the continuation of the good career he has had with the Magic. Is a championship in the Magic’s future? I think Dwight Howard’s season and decision has a lot to do with the answer to that question. This entry was posted in NBA and tagged 1996, BASKETBALL, celtics tickets, drama, Dwight Howard, free agents, kobe, kobe bryant, lakers, magic, magic tickets, NBA, nba finals, orlando, playoffs, shaq, sport, sports, stan van gundy, tv, watch live sports. Bookmark the permalink.